The global magnetic sensors market was valued at US$ 2,112.6 Mn in 2017, whereas the demand was estimated at 3,488.0 thousand units in the same year. The market is expected to register a stable CAGR of over 7% during the forecast period 2018 to 2026, according to a new report published by Transparency Market Research (TMR) titled “Magnetic Sensors Market” – Global Industry Analysis, Size, Share, Growth, Trends, and Forecast, 2018–2026.” Encouragement from the government to use eco-friendly vehicles and growth of consumer electronics and appliances has increased the penetration and growth of the magnetic sensors market globally. The market in North America is expanding at a significant CAGR of 7.3% on the backdrop of growing deployment of autonomous vehicles and presence of large number of market players. Technological advancements in consumer electronics with proliferation of IoT technology are expected to increase the demand for magnetic field sensors. Demand for advanced sensing has increased significantly over the past few years primarily due to growing popularity of sophisticated smartphones. Various consumer electronics companies across the world are deploying sensing devices with magnetic sensors in order to deliver contactless measurement with enhanced accuracy and reliability. Semiconductor providers from North America are continuously taking efforts to introduce advanced technology sensors that are used in exercise equipment, household appliances, digital cameras, smartphones, toys, and other electronic devices and equipment. 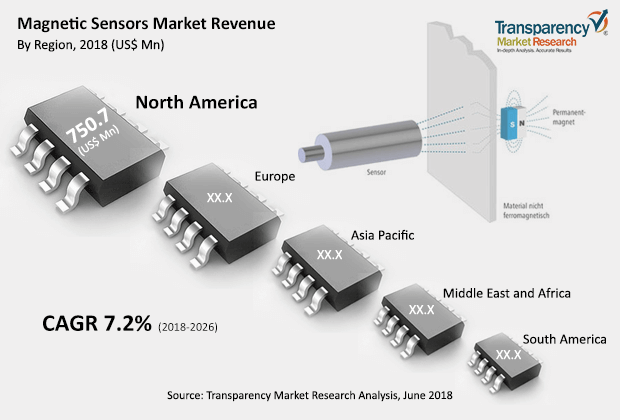 Key trends prevalent in the magnetic sensors market are tunnel magneto resistance (TMR) linear magnetic field sensors, ultra-low pressure sensor, miniaturized magnetic sensors, automotive sensors, and RFID magnetic sensors. The technology segment is divided into Hall Effect, anisotropic magneto resistance (AMR), giant magneto resistance (GMR), tunnel magneto resistance (TMR), and others. Hall Effect segment is anticipated to dominate the market as it offers a wide range of benefits, including ease of implementation, variety of output options, a wide range of operating voltage, high reliability, and compact design. This technology offers high output and sensitivity and provides unique sensing capabilities. These factors are expected to boost the growth of the magnetic sensors market. Hall Effect segment is anticipated to expand at the highest CAGR of 7.6% during the forecast period 2018 to 2026. Tunnel Magneto Resistance (TMR) segment is projected to expand at a significant CAGR over the forecast period owing to the broad range of industrial applications. The application segment is divided into automotive, consumer electronics, industrial and others. Automotive segment is anticipated to dominate the market owing to the growing deployment of autonomous vehicles around the globe. Sensor vendors are emphasizing on providing efficient devices which can serve a wide range of applications. Sensing devices are being increasingly used in the automotive sector to improve vehicles’ fuel efficiency, convenience, and safety. Growing use of electric vehicles (EVs) is escalating the demand for several sensing devices, including magnetic sensors. Automotive segment is anticipated to expand at the highest CAGR of 7.6% during the forecast period 2018 to 2026. Consumer electronics segment is projected to expand at a significant CAGR over the forecast period owing to the growing use of smartphones and consumer wearable devices such as smart watches and health monitoring devices. Geographically, the global magnetic sensors market is divided into five major geographical regions, including North America, Europe, Asia Pacific, South America, and Middle East & Africa. In 2017, North America was the topmost revenue generating region followed by Asia Pacific. Semiconductor providers from North America are continuously taking efforts to introduce advanced technology sensors that are used in household appliances, digital cameras, smartphones, toys, and other electronic devices and equipment. The U.S. held the highest market share in 2017 in North America and is estimated to expand at a considerable CAGR during the forecast period. The market in Europe is anticipated to expand at a significant CAGR during the forecast period due to the growing technological advancements in automotive industry. Countries across the European Union are now focusing on adopting hybrid cars that require Hall Effect current sensing in vehicle’s power systems in order to enhance the performance at low costs. The magnetic sensors market in Asia Pacific is further expected to expand at the highest CAGR of 8.7% over the forecast period. Factors such as growing popularity of smartphones and wearable devices and strong presence of major sensor vendors in Asian countries such as China and Japan have impacted the regional market growth positively. Middle East & Africa and South America are expected to expand at a substantial pace due to the growing investments in the consumer electronic industry in the regions. The company profiling of key players in the global magnetic sensors market includes company overview, major business strategies adopted, SWOT analysis, and market revenues for years 2016 to 2018. The key players profiled in the global magnetic sensors market includes Infineon Technologies AG, Honeywell International Inc., NXP Semiconductors, Alps Electric Co. Ltd, Analog Devices, Inc., TE Connectivity Corporation, Allegro Microsystems, Inc., Asahi Kasei Corporation, Magnetic Sensors Corporation, and Elmos Semiconductor AG. Various players are establishing partnerships to provide technologically advanced sensing devices on a large scale in order to meet the continuously increasing demand for sensing accuracy and efficiency.